This legal database project was made possible by a European Union grant to the Irish Refugee Council. 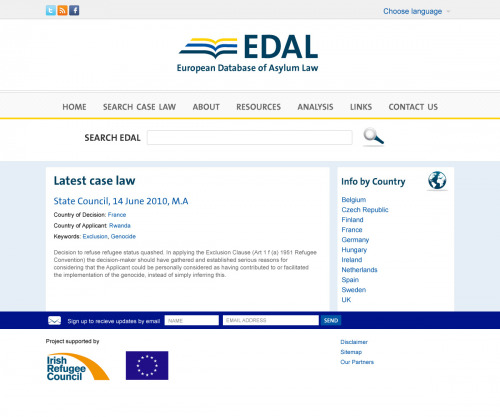 The idea was to create a central searchable archive of immigration case law summaries from 11 EU member states which would allow for useful comparisons of cases across the countries according to a set of priority issues and provisions. At its simplest the site provides a powerful search through hundreds of legal case law records. But for researchers who are engaged in comparative study there are numerous cross referencing features that allow you to check legal provisions and how they've been cited and made applicable across the member states. The site also is also features multi-lingual content publishing for untranslated source content, a pdf converter tool for creating pdfs out of case law summaries, and a responsive design for accessing the site on mobile devices.